To borrow from a USGA article written about course care, “Being a good player does not make you a good golfer”. Good players generally have good control of their golf game, can score low with some regularity, and commonly maintain lower handicaps. Good golfers fill divots, repair ball marks, rake bunkers, and in general understand the “spirit” of the game practicing good etiquette each and every time they are on the course. Clearly, there are any number of challenges to being a really good player, but there really should be no constraint for all who enjoy the game to be responsibly good golfers. Although the Wilmington Country Club Hand Book specifies a limited number of rules applied to course care behavior concentrating primarily on Short Game and Wedge Range Practice and cart conduct. There are a few recommendations not covered as hard and fast rules that can prove to be significant factors in our ability to successfully provide the quality of presentation our member’s desire and deserve. Here are just a couple items we would like all of our golfers to consider seriously. 1. 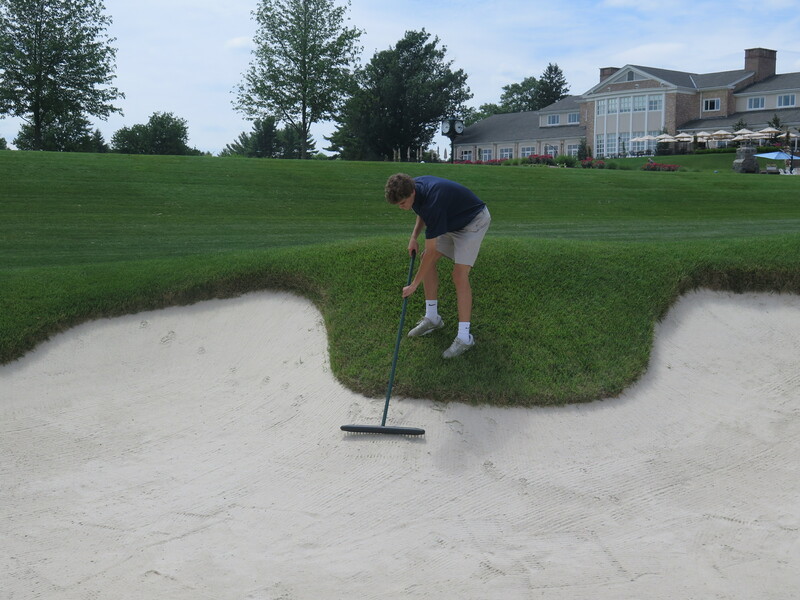 Bunker banks – everyone who plays the game understands the necessity to rake a bunker following play from it. Not all players are aware that there is a recommended way to enter and exit the sand. The vast majority of bunkers here at Wilmington CC have some portion of steep grass embankment. Often times a ball may come to rest in the sand close to that embankment. Yes, the shortest route to the ball may be via that steep slope, but it is not the safest route and you will likely not be able to rake the bunker properly. Besides the risk of physically harming yourself, repeat climbers do a lot of damage to the turf in very short order. 2. On course practice – The rules of golf cover all conditions of replaying a shot including playing a provisional ball if necessary. The tenets of course etiquette may also excuse an occasional second ball be dropped to replay a shot or a putt, (yes, even a Mulligan on the first tee if fellow players agree), but actions causing added injury or playing delays should not occur with any regularity. This is simply a matter of respect for the facilities and for your fellow players. 3. 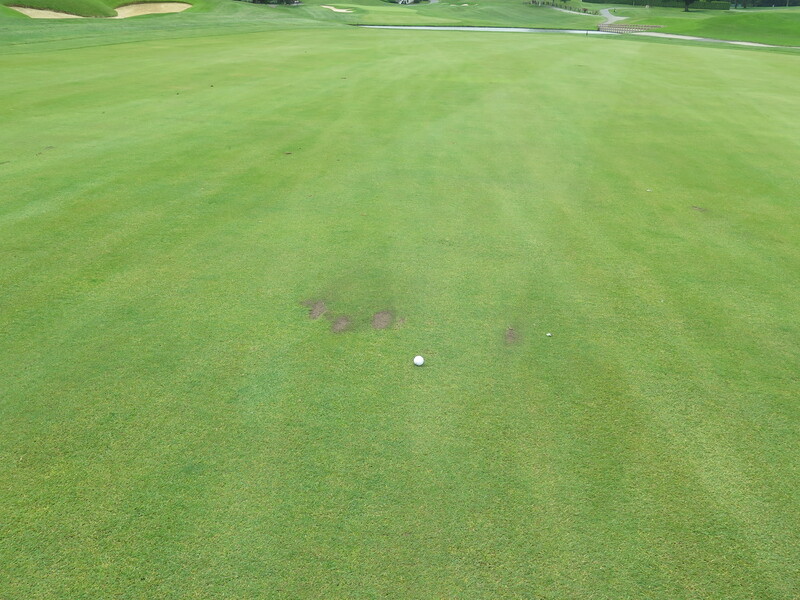 Ball Marks and Divot holes (a divot is a piece of turf removed from the ground in our case by a golf club) – every golfer is aware that they are responsible for repair of their ball marks on greens and their divots holes on tees and fairways. The good golfer takes this responsibility very seriously and often times fixes extra ball marks or fills additional divot holes other than his own that were somehow overlooked previously. We remind all golfers that immediate repair is the most important factor for ball mark recovery, and that the mix provided, filled only to the level of the base of the grass blade, is the more effective approach to assure recovery from divot holes. Replace the actual divot turf only if no mix is available. 4. Short Game Practice Range – the Rules of the SGPR state that “all shots that may cause ball marks should be hit to target greens other than the main putting green”. In the spirit of the intent of short game practice as well as the desired quality of chipping surfaces, we strongly recommend that ball marks be avoided on all greens of the SGPR and that this activity be limited to the Wedge Range. 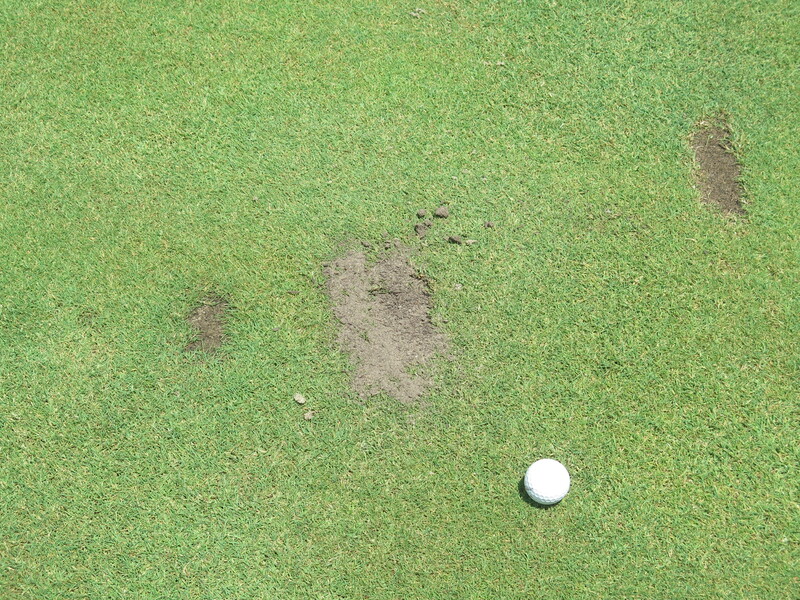 Ball marks clearly disrupt the roll and results of trueness of a chip shot which is an important aspect for this form of practice.